1. Keep storm drains clear of leaves, branches and grass clippings. These drains help protect homes and businesses from flooding. When the drains clog or materials block the flow of water into the drains, the water rises quickly. 2. Carefully plan landscaping so that you don’t alter the land in a way that can result in water ponds next to your structure. The land should slope downhill away from the structure. Avoid building landscaping berms that can increase flood risk by allowing water to generate velocity running down the berm toward your home or business. 3. Before adding onto your home, you, your architect, engineer or contractor should meet with local officials to ensure that your proposed addition will be safe from flooding. For example, if your home is post and beam construction (commonly referred to as on stilts), don't convert the open area underneath the living area into additional living area without checking with your local building officials. In most cases, the area beneath your living area has been left open to allow water to pond up or flow. If you convert the open area to living space, you may block the flow of water, which could lead to flooding and structural damage. 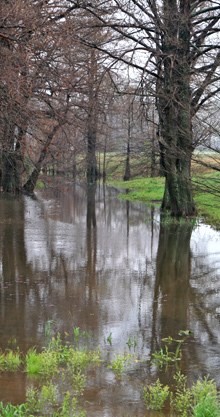 Levees provide strong flood protection, but they are not failsafe. 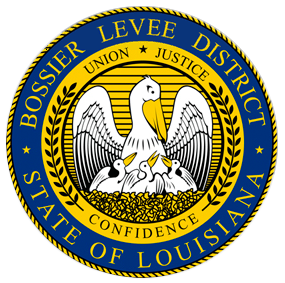 Levees are designed to protect against a specific flood level and could be overtopped during severe weather events. Unfortunately, in the rare occurrence when a levee system fails or is overtopped, severe flooding can occur due to increased elevation differences associated with levees and the increased water velocity that is created. It’s also important to remember that no levee provides protection from events for which it was not designed, and proper operation and maintenance are necessary to reduce the probability of failure. Many people do not realize that it doesn’t take a large amount of water to flood out a vehicle and strand motorists. Six inches of water will reach the bottom of most passenger cars causing loss of control and possible stalling. A foot of water will float many vehicles, and two feet of rushing water can carry away most vehicles. Exercise great caution when approaching standing water during and immediately after heavy rains. Don’t stack the bags too steeply. Don’t over handle the bags. Do choose an appropriate transport vehicle.